Most Orders over $75 are eligible for FREE SHIPPING - Free shipping applies to ground shipping only. Products eligible for free shipping will have a free shipping option at checkout. Oversized and Heavy orders that require freight shipping (Hydrocollators, tables, exercise equipment, etc) are typically not eligible for free shipping. Fixed shipping charges are for standard delivery. Most orders placed before 1:00 pm ET will be shipped on the same business day. Most orders placed after 1:00 pm ET and on weekends and Holidays will be Shipped on the Next Business Day. If there is a delay longer than 3 Business days or if we are unable to ship an expedited order, we will do our best to contact you by email or phone. *Estimated Shipping Time is an ESTIMATE - if you need delivery by a specific date, please call us or put a note in your order. If it is imperative that you receive an item by a specific date, choose Next Business Day Shipping at Checkout or Call for additional options. Orders placed online on Friday (after shipping cutoff) and over the weekend, will process and ship on Monday via the shipping option chosen at checkout. Some Items such as treatment tables require special freight shipping. Freight charges are calculated on an individual basis. Residential Delivery, White Glove Service or Delivery inside of a building is typically an extra cost. If you would like a shipping estimate for one of these select services before placing your order contact Customer Service. FedEx Overnight and 2 Day Air does NOT include Saturday Delivery. Overnight orders placed on Fridays will be delivered the following Monday excluding certain Holidays. 2 Day Air orders placed on Thursday will be delivered the following Monday. If you require FedEx Saturday delivery - Please Call to Place your Order with a Customer Service Representative. Not All Items and Locations are available for Saturday Delivery. In addition to the Next Day Air shipping fees, an additional $15-$20 will be charged if Saturday delivery is required. We reserve the right to determine which shipping method will be used for free or standard shipping (Free shipping includes either United States Postal Service or FedEx). Our goal is to deliver the product to you as quickly as possible while maintaining fair shipping costs to our customers! Shipping charges are estimated based on weight and distance. We will determine the fastest method of delivery to you, either USPS Priority mail or FedEx. We offer upgraded shipping options via Fedex. If you do not see your preferred shipping method as an option at checkout, please place that information in the Note section of the Order, or call/email with the specific date. Additional shipping charges may apply depending on the specifics of your situation. 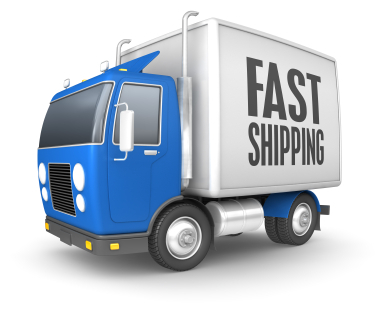 We will give you an estimated quote of express shipping fees when you call or email. Shipments placed to outside the 48 states may incure additional shipping charges depending on the size and weight of the items ordered. Please contact us if you have any questions before placing your order.